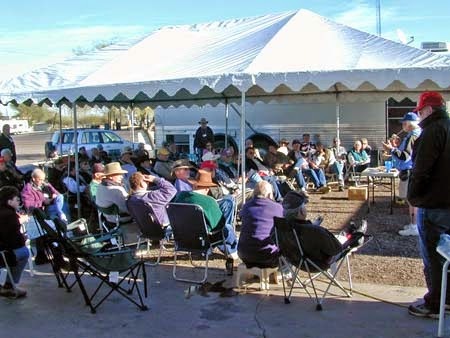 In 2003, the first satellite rally was held in Gila Bend, AZ … at a truck stop parking area. The original mobile HughesNet dealer, Old Scout, operated out of this truck stop and he hosted the rally. 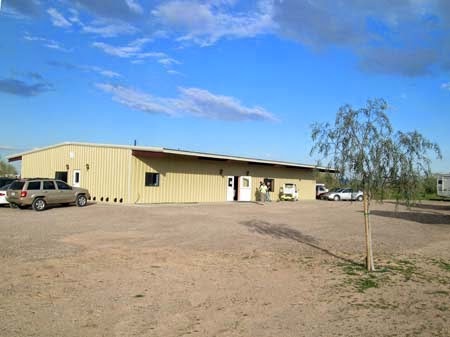 He got permission from the owner of the land to take over the entire lot on one side of the road for RV parking … no big rigs allowed for this weekend! Below is a photo taken from an ultralight, by the UPS driver who delivered to the area and was also a mobile satellite installer. 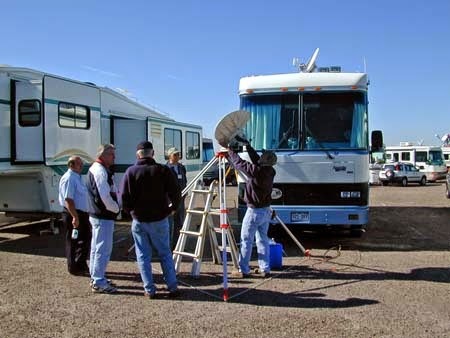 We had sessions about how to set up your satellite equipment and get online, how you could share that Internet connection so anyone in the RV could get online at the same time (WITHOUT having to shut down the modem, move the modem cable to another PC and boot the modem again), troubleshooting, and even satellite TV. The whole idea was to share ideas about things we learned, and help those new to mobile satellite have less frustration with their setups. Note the size of the group in the group shot below, which was taken at the first rally … keep this one in mind, when you see the group shot for the last rally held in 2007. You’ll notice a lot more people in the photo. The second rally was held in the same location and was very much like the first, except for a few more people. One member started the Red Hat Satellites chapter. 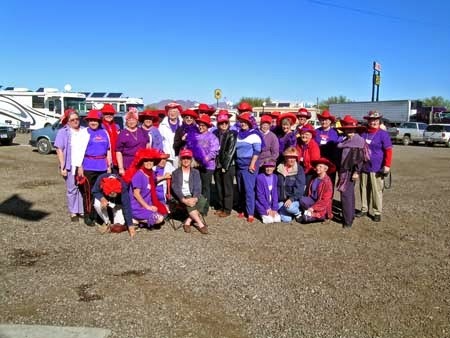 So, of course, we had a Red Hat luncheon, as shown below. 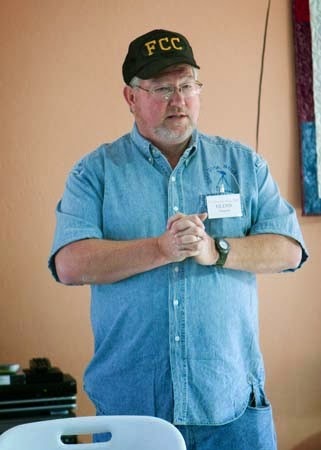 The next photo shows me delivering one of my annual networking presentations. 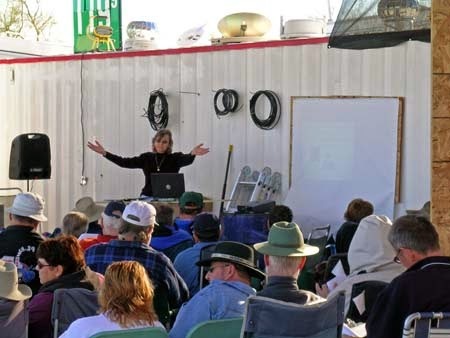 This was always a popular presentation, because it was a little more complicated then, to get a local area network working properly, in the RV. 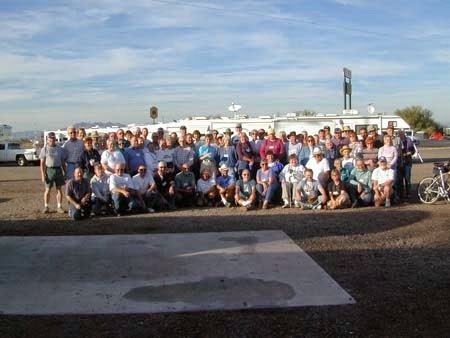 At the end of the 2004 rally, we all decided to hold the next rally at Augie’s Quail Trail RV Park, down the road … they had a clubhouse, to get out of the weather, and we would all have full hookups for our RVs. I talked to the owner and he extended a special rally rate to us for the 2005 rally. We didn’t know it at the time, but this change also represented a parting of the ways, with Old Scout. During the 2004 Rally, Old Scout had finally agreed to sponsor us to attend installer training and become certified HughesNet installers. Little did we know until later in the year, that he was moving away from HughesNet entirely and was the exclusive dealer for the Beta test of the StarBand Mobile Satellite program. 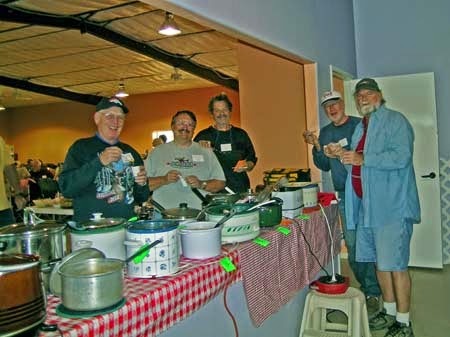 We added a Chili Cookoff to the 2005 agenda and a pot luck dinner … it was sooooooo nice to be able to all get together without the wind and sometimes too-cool weather! The 2006 rally included all the things from the year before, but we again added more to the agenda. We were starting to get noticed and suddenly we had an offer from Beaudry RV to attend and serve appetizers one afternoon. 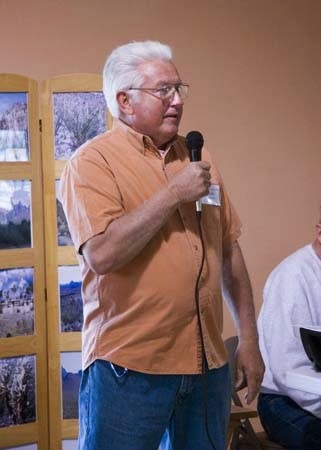 We also had a welcome visit from the Gila Bend City Manager, the Chamber of Commerce, and, John, the owner of the RV park. 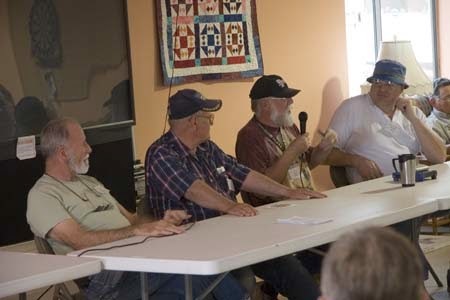 We also had panel discussions, along with the presentations. 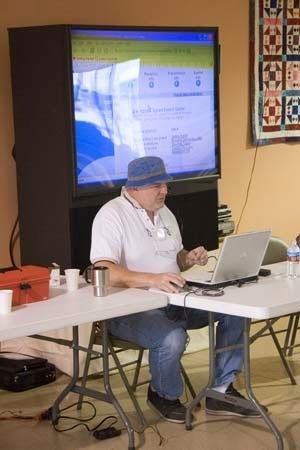 Glenn, one of the regular presenters and a very experienced installer, gave his talk in an FCC hat this year … Worrying about the FCC was now a standing joke. By this time we had learned that the FCC was much more concerned about the powerful equipment of the service providers. 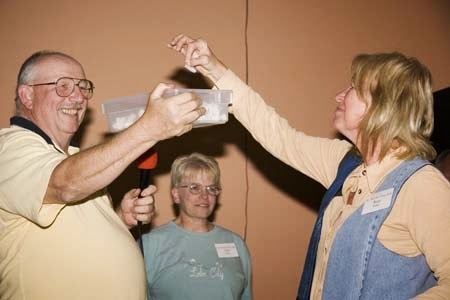 The results of the Chili Cookoff was enjoyed by all. We also started charging a small fee and giving away door prizes on the last afternoon. 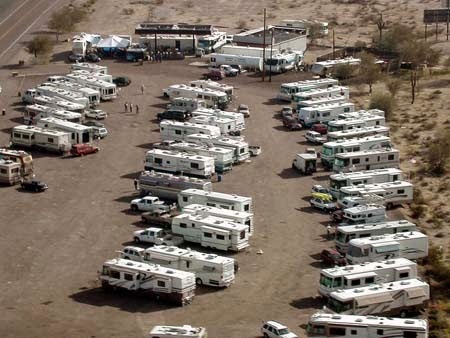 At the last rally in 2007, the number of attendees topped 200 people and there were over 100 RVs! Not only did we again get visits from the City of Gila Bend and a welcome from the park owner, but we even had entertainment one afternoon. 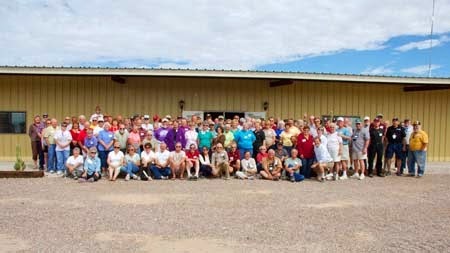 Of course, the number of volunteers needed to put it all together also grew. 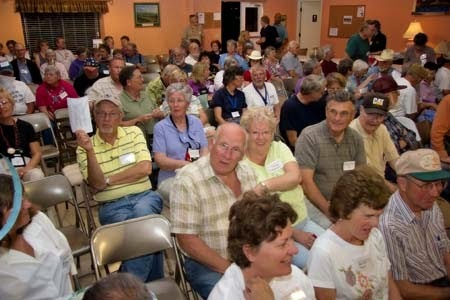 Notice how big the group had become by the 2007 Rally. None of us realized this would be the last rally we held. 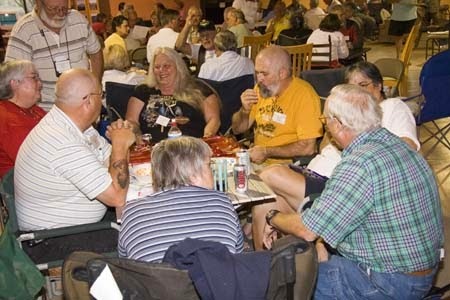 The five rallies were a lot of things … they were a helpful exchange of information … they were an exercise in organization and planning … and they were a chance to get together with other RVers who wanted to take their Internet with them on the road! 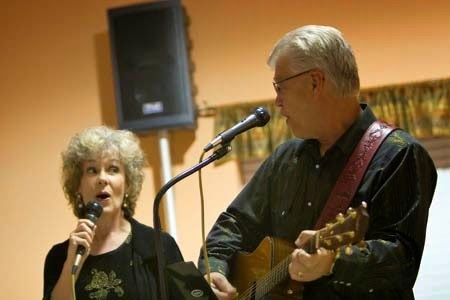 But, perhaps most importantly, they were a fun time, with a camaraderie that led to longstanding friendships! Copyright © 2019	BJ Consulting, Inc & MobileInternetSatellite.com. All rights reserved.